So, after an epic break from blogging, Licker Geospatial Consulting is back at it, with a nice new post on our favorite topic, Urban Change! Part of this has been spurred on by our recent collaboration with the fine folks at Renewable Cities. With them, we've been looking at changes in population dynamics over time in Metro Vancouver, British Columbia and other Major Canadian Municipalities. This post will show off something similar but will be more related to how we can possibly understand multi-temporal, multi-variate changes through some nifty mapping. Now as many of our past and current collaborators know, Licker Geospatial Consulting cut their teeth in urban planning and then did a right angle turn into environmental planning and earth sciences (and then some sort of squiggle into geospatial consulting!). One of the coolest things about the earth sciences (i.e. geotech) is the use of cross sections to comprehend and visualize multi-dimensional data. Now because urban planners need to fancy things up all the time, they took the humble cross section and renamed it: The Transect (Thanks DPZ) The transect is, of course, totally awesome and very useful to help planners systemize urban environments. Very rarely, however, do we see the transect used as a tool for urban analysis and information synthesis. Even more rarely do we see transects used to understand temporal change. What we want to achieve with this post is to show how a transect, or cross section can be employed to understand urban spatial-temporal change and possibly the influence of mass transit on urban development. A big data jumble, 1971 data are light blue polygons, 1981 and 1986 data are light and dark blue points respectively, and 1991, 1996, 2001, 2006, 2011 and 2016 data are purple, blue, red, black and green respectively... Nothing matches up!! So we got the density by year and you'll note we found some Skytrain lines somewhere. It's time to run some sections! Cross sections are pretty cool because they allow us to view overlaid data along a common axis, which greatly enhances our ability to synthesize data at a glance (In English again: lots of data quickly). What we did was: first, measure the change in population density between 2016 and 1976 (40 years of change: superb!) to develop an overall understanding of change, and second we used some GIS wizardry (go to the very end of this post for the method) to develop sections by Skytrain line. The results, with a little bit of interpretation are displayed below for your amusement and edification (click to expand all figures). Let's walk through this slowly. First the rainbow of colours on the top figure represent change in population density, as expressed by the average number of people per hectare within an 800m neighborhood. Areas that are red are where the population has actually declined in the past 40 years and areas in brown are where it has increased (sometimes a lot!). The bottom graph shows the population density along the line starting at Waterfront Station to the left and ending at King George Station to the right. Each line represents the population density at that particular year. The Expo line was more or less completely built out by 1995, but change along the route has varied tremendously by station location. First note that between 1976 and 1986 there was almost no growth along the line! (astounding in this day in age!) However, post expo things started to change mostly around Joyce Station and New Westminster. After 1996 there was a ton of development around the Edmonds and Joyce Skytrain stops as well as in Downtown Vancouver (certainly related to de-industrialization and the Skytrain). After that development boomlet, you'll notice that the next big changes were both in Downtown Vancouver and in Surrey which saw the most growth in the 2006-2016 period. There are some other cool things to note: population density has not materially changed much at Nanaimo station, 29th Avenue, 22nd Avenue, and Scott Road (I would love to look at changes to employment though!). It's a different story for density along the M line (and the sneaky extension I added in there) than the E line, that is for certain. First, you'll note that residential density increased very little in the City of Vancouver in the past 40 years along this line (likely because most of the existing M line route is still surrounded by active Industrial Land, for the most part, as well as by low density residential lands and the new M Line extension had not been built yet). However, Burnaby is a different (and interesting story). 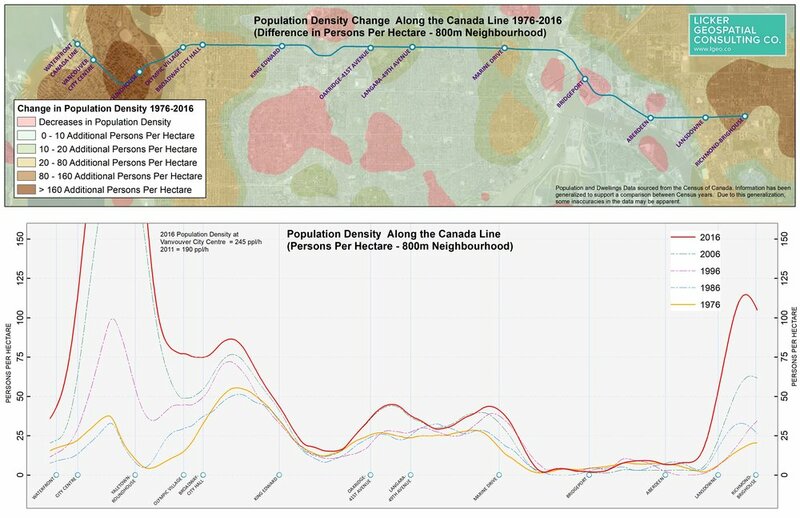 First, Skytrain induced development caused population density at both Gilmore, Brentwood, and Holdom to increase from effectively 0 people per hectare in 1996 to about 75 persons per hectare in 10 years! There's been a similar rate of change in Central Coquitlam as well. Another interesting density spurt is at Loughheed Town Centre which had a huge boom between 1976 and 1986 that didn't happen anywhere else along the line (this was basically due to an attempt at highway oriented multi-family development!). Finally, it looks like Moody Centre and Coquitlam Centre are due for booms given the recent Evergreen line extensions. So, a drawback from similar scales between these three figures means that population density at the Yaletown Station is literally off the chart! To properly understand this change just note that in 20 years, the population density at Yaletown Roundhouse has increased from 100 persons per hectare to 245! (and was 0 in 1986!!!) Nothing else in the lower mainland even comes close. Take, for instance, the stretch between King Edward and 41st Avenue, basically zero change in 40 years. Richmond has seen some pretty big changes in the past 20 years but an order of magnitude less than Vancouver (likely flight path/flood plain induced). Now, more than any other graph we've looked at in this little assessment, this one will change the most in the next 5-10 years as there are big changes underfoot in the Cambie Corridor area, so stay tuned for a follow up blog post in 2022 ;) . As with all of our posts here, we are trying to highlight an application of geospatial analysis that can help us make better urban planning decisions and understand our urban environments. The next time someone questions the transformative impact of mass transit coupled with de-industrialization then all you need to do is show them these graphs and explain what a cross-section is. (if only it were that easy). That being said, all this work is exploratory in nature, but super fun to do, so if you feel the need to conduct some longitudinal urban analysis then feel free to drop a line to aaron@lgeo.co. If you want to pick this post or our methods apart, the comment section is below! Finally, Nerdy method for making the graphs. Simply put the method is to: first interpolate the vertices of a line against a surface and then plot those those interpolated values as y values on an xy graph where x values are measured and scaled against the length of the line! Because I cut my teeth as young GIS analyst supporting land use planners, I am huge sucker for old land use maps. Recently, my old colleague Peter Russel from the City of Richmond found an amazing copy of Development in the Western Portion of the Lower Mainland Region, 1968. How amazing is this map? Well for starters, it is completely packed with information, its super well designed, and it was drawn up almost exactly 50 years ago! Now the reason why I really love this map, is that it provides an extremely valuable perspective on long range land use planning and the evolution of our urban environments. That is to say, if we know how much things have changed in the last 50 years, we can start to grapple with the profound challenge of figuring out the next 50. To do this, we can use a bit of fancy GIS and can run some fairly cool analysis on this map to figure out how things have changed. The first thing you notice is how much influence the Fraser River had on the development of our region. In 1968, the original Port Mann Bridge had only been constructed four years prior in 1964, the Massey Tunnel had only been around since 1957, and only the venerable Pattullo Bridge had been standing since 1937. These lack of connections were likely one reason why the population south of the Fraser River was so small. Second, you can notice how agricultural lands are relatively unchanged since 1968, likely that is due to the implementation of the Agricultural Land Reserve which was established in 1974. Finally, notice the primacy of roads and highways on this figure. By the time this map was produced, our region was completely ensconced in the world of motordom. Cars were the mode of choice on this figure and it shows. Rail lines are shown but faintly and only fragments of the interurban lines can be inferred from the very interesting place names scattered throughout Metro's suburban communities. Contrast this map with Metro Vancouver's Regional Growth Strategy map here. You'll note that roads and highways are completely de-emphasized with a focus instead on transit and multi-nodal development has supplanted land uses. Use the simple application below to explore the figure. I've found that by fiddling around with opacity of the figure (or the extracted data), it becomes really easy to see what has changed. Once you are done panning zooming and overlaying, check out the discussion below for some insights into the evolution of our region. Extracting digital data from old figures is a profession in of itself. I'm not an expert in this area and I am sure that others couple likely do a better job. That being said I used a simple interactive supervised classification system coupled with some aggregation and manual correction to try and extract all the land use types. If you can't read GIS, in English what I did was pull the colours of the map and make some assumptions about things I couldn't see. There is no way for me to easily verify the veracity of this figure. That is to say, some of the information could just be plain wrong, out of place or simply ambiguous. I just don't know because I was neither alive nor present in the Lower Mainland in 1968. So, calling all baby boomers: I insist that you check to see if Sullivan Station and Essondale were places. Also take a look at Sea Island, note the mystery community there? All area totals are super approximate and based on my digitization. Therefore, please do not live or die on the fact that I've noticed there was approximately 427.5 sq km of agricultural land depicted on this figure in 1968. By the same token, please enjoy the fact that there was apparently 487.4 sq km of agricultural land in 2011 but do not quote the 546.3 sq. km total I've used that corrected for right of ways (more on that below). Somewhat interesting... But the temporal analysis is even more interesting. For instance, how much has the residential footprint grown? Have we really deindustrialized? what about outdoor space? To answer this, as mentioned I've done some work to get the 2011 MV Land Use data in line with the 1968 version. Some notes. Because the 1968 dataset does not have road right-of-ways (ROWS) as a designation, I've had to roll ROWs into all other categories proportionately in the 2011 dataset and inflate land use numbers by approximately 200 sq. km. With those additional caveats in mind. treat yourself to 50 (...err 45 ) years of land use change! Residential land has increased by 211sq. km. or 80% Population increased by 1.5m (about 900,000 to 2.43m) or 170%, ergo we've sprawled out but we are also more dense than 1968 - despite an addiction to motordom! Industrial land area has increased considerably, Notably, Vancouver's industrial areas have shrunk while Surrey's and NE Sector(especially along the Fraser) have grown dramatically. The ratio of commercial to residential lands has slipped somewhat from 8% to 7% (this may be offset by an increase in industrial and mixed land uses), suggesting that commercial land use demand is linked to residential growth. I could go on, and there are probably many more facts and nuggets that you can glean from the data. So put on your analysis hat because I want to hear them! Please send me your comments, corrections and considerations; because information like what I've exposed above starts conversations that will inevitably allow for better planning and decision making.